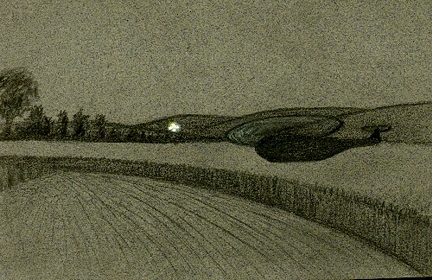 Kris Sherwood's drawing of the large helicopter that shut its lights off as it came straight toward her and husband, Ed Sherwood, while it chased a bright unidentified aerial craft in an East Kennett crop formation on July 31, 2000. Drawing © 2000 by Kris Sherwood. August 20, 2000 East Kennett, Wiltshire, England - This weekend I learned from crop circle researchers, Ed and Kris Sherwood of Millennium Research in Santa Monica, California, that when they were in Wiltshire this summer doing a meditation experiment, the couple had a close encounter with a helicopter and two unidentified aerial craft. The date was July 31st around 11:30 PM and the location was the East Kennett square inside a circle formation. Part of their meditation experiment was psychic photography, to photograph with a flash camera the air around them in an effort to capture images of luminosities and translucent spheres that increasing numbers of people have photographed the past several years. The exact source of the images is still a mystery. Their camera was flashing in the darkness when they first heard a loud helicopter approaching.